"Transparent display" redirects here. For other transparent display technologies, see See-through display. An organic light-emitting diode (OLED) is a light-emitting diode (LED) in which the emissive electroluminescent layer is a film of organic compound that emits light in response to an electric current. This organic layer is situated between two electrodes; typically, at least one of these electrodes is transparent. OLEDs are used to create digital displays in devices such as television screens, computer monitors, portable systems such as smartphones, handheld game consoles and PDAs. A major area of research is the development of white OLED devices for use in solid-state lighting applications. There are two main families of OLED: those based on small molecules and those employing polymers. Adding mobile ions to an OLED creates a light-emitting electrochemical cell (LEC) which has a slightly different mode of operation. An OLED display can be driven with a passive-matrix (PMOLED) or active-matrix (AMOLED) control scheme. In the PMOLED scheme, each row (and line) in the display is controlled sequentially, one by one, whereas AMOLED control uses a thin-film transistor backplane to directly access and switch each individual pixel on or off, allowing for higher resolution and larger display sizes. An OLED display works without a backlight because it emits visible light. Thus, it can display deep black levels and can be thinner and lighter than a liquid crystal display (LCD). In low ambient light conditions (such as a dark room), an OLED screen can achieve a higher contrast ratio than an LCD, regardless of whether the LCD uses cold cathode fluorescent lamps or an LED backlight. André Bernanose and co-workers at the Nancy-Université in France made the first observations of electroluminescence in organic materials in the early 1950s. They applied high alternating voltages in air to materials such as acridine orange, either deposited on or dissolved in cellulose or cellophane thin films. The proposed mechanism was either direct excitation of the dye molecules or excitation of electrons. In 1960 Martin Pope and some of his co-workers at New York University developed ohmic dark-injecting electrode contacts to organic crystals. They further described the necessary energetic requirements (work functions) for hole and electron injecting electrode contacts. These contacts are the basis of charge injection in all modern OLED devices. Pope's group also first observed direct current (DC) electroluminescence under vacuum on a single pure crystal of anthracene and on anthracene crystals doped with tetracene in 1963 using a small area silver electrode at 400 volts. The proposed mechanism was field-accelerated electron excitation of molecular fluorescence. Pope's group reported in 1965 that in the absence of an external electric field, the electroluminescence in anthracene crystals is caused by the recombination of a thermalized electron and hole, and that the conducting level of anthracene is higher in energy than the exciton energy level. Also in 1965, W. Helfrich and W. G. Schneider of the National Research Council in Canada produced double injection recombination electroluminescence for the first time in an anthracene single crystal using hole and electron injecting electrodes, the forerunner of modern double-injection devices. In the same year, Dow Chemical researchers patented a method of preparing electroluminescent cells using high-voltage (500–1500 V) AC-driven (100–3000 Hz) electrically insulated one millimetre thin layers of a melted phosphor consisting of ground anthracene powder, tetracene, and graphite powder. Their proposed mechanism involved electronic excitation at the contacts between the graphite particles and the anthracene molecules. Roger Partridge made the first observation of electroluminescence from polymer films at the National Physical Laboratory in the United Kingdom. The device consisted of a film of poly(N-vinylcarbazole) up to 2.2 micrometers thick located between two charge injecting electrodes. The results of the project were patented in 1975 and published in 1983. American physical chemist Ching W. Tang and Steven Van Slyke at Eastman Kodak built the first practical OLED device in 1987. This device used a two-layer structure with separate hole transporting and electron transporting layers such that recombination and light emission occurred in the middle of the organic layer; this resulted in a reduction in operating voltage and improvements in efficiency. Research into polymer electroluminescence culminated in 1990 with J. H. Burroughes et al. at the Cavendish Laboratory at Cambridge University, UK, reporting a high-efficiency green light-emitting polymer-based device using 100 nm thick films of poly(p-phenylene vinylene). Moving from molecular to macromolecular materials solved the problems previously encountered with the long-term stability of the organic films and enabled high-quality films to be easily made. Subsequent research developed multilayer polymers and the new field of plastic electronics and OLED research and device production grew rapidly. Universal Display Corporation a developer and manufacturer based in the United States holds the majority of patents concerning the commercialization of OLEDs. A typical OLED is composed of a layer of organic materials situated between two electrodes, the anode and cathode, all deposited on a substrate. The organic molecules are electrically conductive as a result of delocalization of pi electrons caused by conjugation over part or all of the molecule. These materials have conductivity levels ranging from insulators to conductors, and are therefore considered organic semiconductors. The highest occupied and lowest unoccupied molecular orbitals (HOMO and LUMO) of organic semiconductors are analogous to the valence and conduction bands of inorganic semiconductors. Originally, the most basic polymer OLEDs consisted of a single organic layer. One example was the first light-emitting device synthesised by J. H. Burroughes et al., which involved a single layer of poly(p-phenylene vinylene). However multilayer OLEDs can be fabricated with two or more layers in order to improve device efficiency. As well as conductive properties, different materials may be chosen to aid charge injection at electrodes by providing a more gradual electronic profile, or block a charge from reaching the opposite electrode and being wasted. Many modern OLEDs incorporate a simple bilayer structure, consisting of a conductive layer and an emissive layer. More recent developments in OLED architecture improves quantum efficiency (up to 19%) by using a graded heterojunction. In the graded heterojunction architecture, the composition of hole and electron-transport materials varies continuously within the emissive layer with a dopant emitter. The graded heterojunction architecture combines the benefits of both conventional architectures by improving charge injection while simultaneously balancing charge transport within the emissive region. During operation, a voltage is applied across the OLED such that the anode is positive with respect to the cathode. Anodes are picked based upon the quality of their optical transparency, electrical conductivity, and chemical stability. A current of electrons flows through the device from cathode to anode, as electrons are injected into the LUMO of the organic layer at the cathode and withdrawn from the HOMO at the anode. This latter process may also be described as the injection of electron holes into the HOMO. Electrostatic forces bring the electrons and the holes towards each other and they recombine forming an exciton, a bound state of the electron and hole. This happens closer to the emissive layer, because in organic semiconductors holes are generally more mobile than electrons. The decay of this excited state results in a relaxation of the energy levels of the electron, accompanied by emission of radiation whose frequency is in the visible region. The frequency of this radiation depends on the band gap of the material, in this case the difference in energy between the HOMO and LUMO. As electrons and holes are fermions with half integer spin, an exciton may either be in a singlet state or a triplet state depending on how the spins of the electron and hole have been combined. Statistically three triplet excitons will be formed for each singlet exciton. Decay from triplet states (phosphorescence) is spin forbidden, increasing the timescale of the transition and limiting the internal efficiency of fluorescent devices. Phosphorescent organic light-emitting diodes make use of spin–orbit interactions to facilitate intersystem crossing between singlet and triplet states, thus obtaining emission from both singlet and triplet states and improving the internal efficiency. Indium tin oxide (ITO) is commonly used as the anode material. It is transparent to visible light and has a high work function which promotes injection of holes into the HOMO level of the organic layer. A typical conductive layer may consist of PEDOT:PSS as the HOMO level of this material generally lies between the work function of ITO and the HOMO of other commonly used polymers, reducing the energy barriers for hole injection. Metals such as barium and calcium are often used for the cathode as they have low work functions which promote injection of electrons into the LUMO of the organic layer. Such metals are reactive, so they require a capping layer of aluminium to avoid degradation. Experimental research has proven that the properties of the anode, specifically the anode/hole transport layer (HTL) interface topography plays a major role in the efficiency, performance, and lifetime of organic light-emitting diodes. Imperfections in the surface of the anode decrease anode-organic film interface adhesion, increase electrical resistance, and allow for more frequent formation of non-emissive dark spots in the OLED material adversely affecting lifetime. Mechanisms to decrease anode roughness for ITO/glass substrates include the use of thin films and self-assembled monolayers. Also, alternative substrates and anode materials are being considered to increase OLED performance and lifetime. Possible examples include single crystal sapphire substrates treated with gold (Au) film anodes yielding lower work functions, operating voltages, electrical resistance values, and increasing lifetime of OLEDs. Single carrier devices are typically used to study the kinetics and charge transport mechanisms of an organic material and can be useful when trying to study energy transfer processes. As current through the device is composed of only one type of charge carrier, either electrons or holes, recombination does not occur and no light is emitted. For example, electron only devices can be obtained by replacing ITO with a lower work function metal which increases the energy barrier of hole injection. Similarly, hole only devices can be made by using a cathode made solely of aluminium, resulting in an energy barrier too large for efficient electron injection. Balanced charge injection and transfer are required to get high internal efficiency, pure emission of luminance layer without contaminated emission from charge transporting layers, and high stability. A common way to balance charge is optimizing the thickness of the charge transporting layers but is hard to control. Another way is using the exciplex. Exciplex formed between hole-transporting (p-type) and electron-transporting (n-type) side chains to localize electron-hole pairs. Energy is then transferred to luminophore and provide high efficiency. An example of using exciplex is grafting Oxadiazole and carbazole side units in red diketopyrrolopyrrole-doped Copolymer main chain shows improved external quantum efficiency and color purity in no optimized OLED. Efficient OLEDs using small molecules were first developed by Ching W. Tang et al. at Eastman Kodak. The term OLED traditionally refers specifically to this type of device, though the term SM-OLED is also in use. Molecules commonly used in OLEDs include organometallic chelates (for example Alq3, used in the organic light-emitting device reported by Tang et al. ), fluorescent and phosphorescent dyes and conjugated dendrimers. A number of materials are used for their charge transport properties, for example triphenylamine and derivatives are commonly used as materials for hole transport layers. Fluorescent dyes can be chosen to obtain light emission at different wavelengths, and compounds such as perylene, rubrene and quinacridone derivatives are often used. Alq3 has been used as a green emitter, electron transport material and as a host for yellow and red emitting dyes. The production of small molecule devices and displays usually involves thermal evaporation in a vacuum. This makes the production process more expensive and of limited use for large-area devices, than other processing techniques. However, contrary to polymer-based devices, the vacuum deposition process enables the formation of well controlled, homogeneous films, and the construction of very complex multi-layer structures. This high flexibility in layer design, enabling distinct charge transport and charge blocking layers to be formed, is the main reason for the high efficiencies of the small molecule OLEDs. Coherent emission from a laser dye-doped tandem SM-OLED device, excited in the pulsed regime, has been demonstrated. The emission is nearly diffraction limited with a spectral width similar to that of broadband dye lasers. Researchers report luminescence from a single polymer molecule, representing the smallest possible organic light-emitting diode (OLED) device. Scientists will be able to optimize substances to produce more powerful light emissions. Finally, this work is a first step towards making molecule-sized components that combine electronic and optical properties. Similar components could form the basis of a molecular computer. Polymer light-emitting diodes (PLED, P-OLED), also light-emitting polymers (LEP), involve an electroluminescent conductive polymer that emits light when connected to an external voltage. They are used as a thin film for full-spectrum colour displays. Polymer OLEDs are quite efficient and require a relatively small amount of power for the amount of light produced. Vacuum deposition is not a suitable method for forming thin films of polymers. However, polymers can be processed in solution, and spin coating is a common method of depositing thin polymer films. This method is more suited to forming large-area films than thermal evaporation. No vacuum is required, and the emissive materials can also be applied on the substrate by a technique derived from commercial inkjet printing. However, as the application of subsequent layers tends to dissolve those already present, formation of multilayer structures is difficult with these methods. The metal cathode may still need to be deposited by thermal evaporation in vacuum. An alternative method to vacuum deposition is to deposit a Langmuir-Blodgett film. Typical polymers used in pleaded displays include derivatives of poly(p-phenylene vinylene) and polyfluorene. Substitution of side chains onto the polymer backbone may determine the colour of emitted light or the stability and solubility of the polymer for performance and ease of processing. While unsubstituted poly(p-phenylene vinylene) (PPV) is typically insoluble, a number of PPVs and related poly(naphthalene vinylene)s (PNVs) that are soluble in organic solvents or water have been prepared via ring opening metathesis polymerization. These water-soluble polymers or conjugated poly electrolytes (CPEs) also can be used as hole injection layers alone or in combination with nanoparticles like graphene. Ir(mppy)3, a phosphorescent dopant which emits green light. Phosphorescent organic light-emitting diodes use the principle of electrophosphorescence to convert electrical energy in an OLED into light in a highly efficient manner, with the internal quantum efficiencies of such devices approaching 100%. Typically, a polymer such as poly(N-vinylcarbazole) is used as a host material to which an organometallic complex is added as a dopant. Iridium complexes such as Ir(mppy)3 are currently the focus of research, although complexes based on other heavy metals such as platinum have also been used. The heavy metal atom at the centre of these complexes exhibits strong spin-orbit coupling, facilitating intersystem crossing between singlet and triplet states. By using these phosphorescent materials, both singlet and triplet excitons will be able to decay radiatively, hence improving the internal quantum efficiency of the device compared to a standard OLED where only the singlet states will contribute to emission of light. Applications of OLEDs in solid state lighting require the achievement of high brightness with good CIE coordinates (for white emission). The use of macromolecular species like polyhedral oligomeric silsesquioxanes (POSS) in conjunction with the use of phosphorescent species such as Ir for printed OLEDs have exhibited brightnesses as high as 10,000 cd/m2. Bottom or top distinction refers not to orientation of the OLED display, but to the direction that emitted light exits the device. OLED devices are classified as bottom emission devices if light emitted passes through the transparent or semi-transparent bottom electrode and substrate on which the panel was manufactured. Top emission devices are classified based on whether or not the light emitted from the OLED device exits through the lid that is added following fabrication of the device. Top-emitting OLEDs are better suited for active-matrix applications as they can be more easily integrated with a non-transparent transistor backplane. The TFT array attached to the bottom substrate on which AMOLEDs are manufactured are typically non-transparent, resulting in considerable blockage of transmitted light if the device followed a bottom emitting scheme. Transparent OLEDs use transparent or semi-transparent contacts on both sides of the device to create displays that can be made to be both top and bottom emitting (transparent). TOLEDs can greatly improve contrast, making it much easier to view displays in bright sunlight. This technology can be used in Head-up displays, smart windows or augmented reality applications. Graded heterojunction OLEDs gradually decrease the ratio of electron holes to electron transporting chemicals. This results in almost double the quantum efficiency of existing OLEDs. Stacked OLEDs use a pixel architecture that stacks the red, green, and blue subpixels on top of one another instead of next to one another, leading to substantial increase in gamut and color depth, and greatly reducing pixel gap. Currently, other display technologies have the RGB (and RGBW) pixels mapped next to each other decreasing potential resolution. In contrast to a conventional OLED, in which the anode is placed on the substrate, an Inverted OLED uses a bottom cathode that can be connected to the drain end of an n-channel TFT especially for the low cost amorphous silicon TFT backplane useful in the manufacturing of AMOLED displays. Most commonly used patterning method for organic light-emitting display is shadow masking during film deposition. Also called as "RGB side-by-side" method or "RGB pixelation" method. Metal sheet with multiple apertures made of low thermal expansion material, such as nickel alloy, is placed between heated evaporation source and substrate, so that the organic or inorganic material from evaporation source is deposited only to the desired location on the substrate. Almost all small OLED displays for smartphones have been manufactured using this method. Although shadow-mask patterning method is mature technology used from the first OLED manufacturing, it causes many issues like dark spot formation due to mask-substrate contact or misalignment of the pattern due to the deformation of shadow mask. Such defect formation can be regarded as trivial when the display size is small, however it causes serious issues when a large display is manufactured, which brings significant production yield loss. To circumvent such issues, white emission device with 4-sub-pixel color filter (white, red, green and blue) has been used for large television. In spite of the light absorption by color filter, state-of-art OLED television can make high color reproduction, such as 100% NTSC, and low power consumption happen at the same time, using emission spectrum with high human-eye sensitivity, special color filters with low spectrum overlap and performance tuning with color statistic into consideration. This approach is also called as "Color-by-white" method. There are other type of emerging patterning technologies to increase the manufacturabiltiy of OLED. Patternable organic light-emitting devices use a light or heat activated electroactive layer. A latent material (PEDOT-TMA) is included in this layer that, upon activation, becomes highly efficient as a hole injection layer. Using this process, light-emitting devices with arbitrary patterns can be prepared. Colour patterning can be accomplished by means of laser, such as radiation-induced sublimation transfer (RIST). Organic vapour jet printing (OVJP) uses an inert carrier gas, such as argon or nitrogen, to transport evaporated organic molecules (as in organic vapour phase deposition). The gas is expelled through a micrometre-sized nozzle or nozzle array close to the substrate as it is being translated. This allows printing arbitrary multilayer patterns without the use of solvents. Like ink jet material depositioning, inkjet etching (IJE) deposits precise amounts of solvent onto a substrate designed to selectively dissolve the substrate material and induce a structure or pattern. Inkjet etching of polymer layers in OLED's can be used to increase the overall out-coupling efficiency. In OLEDs, light produced from the emissive layers of the OLED is partially transmitted out of the device and partially trapped inside the device by total internal reflection (TIR). This trapped light is wave-guided along the interior of the device until it reaches an edge where it is dissipated by either absorption or emission. Inkjet etching can be used to selectively alter the polymeric layers of OLED structures to decrease overall TIR and increase out-coupling efficiency of the OLED. Compared to a non-etched polymer layer, the structured polymer layer in the OLED structure from the IJE process helps to decrease the TIR of the OLED device. IJE solvents are commonly organic instead of water-based due to their non-acidic nature and ability to effectively dissolve materials at temperatures under the boiling point of water. Transfer-printing is an emerging technology to assemble large numbers of parallel OLED and AMOLED devices efficiently. It takes advantage of standard metal deposition, photolithography, and etching to create alignment marks commonly on glass or other device substrates. Thin polymer adhesive layers are applied to enhance resistance to particles and surface defects. Microscale ICs are transfer-printed onto the adhesive surface and then baked to fully cure adhesive layers. An additional photosensitive polymer layer is applied to the substrate to account for the topography caused by the printed ICs, reintroducing a flat surface. Photolithography and etching removes some polymer layers to uncover conductive pads on the ICs. Afterwards, the anode layer is applied to the device backplane to form bottom electrode. OLED layers are applied to the anode layer with conventional vapor deposition, and covered with a conductive metal electrode layer. As of 2011[update] transfer-printing was capable to print onto target substrates up to 500mm X 400mm. This size limit needs to expand for transfer-printing to become a common process for the fabrication of large OLED/AMOLED displays. For a high resolution display like a TV, a TFT backplane is necessary to drive the pixels correctly. Currently, low temperature polycrystalline silicon (LTPS) – thin-film transistor (TFT) is used for commercial AMOLED displays. LTPS-TFT has variation of the performance in a display, so various compensation circuits have been reported. Due to the size limitation of the excimer laser used for LTPS, the AMOLED size was limited. To cope with the hurdle related to the panel size, amorphous-silicon/microcrystalline-silicon backplanes have been reported with large display prototype demonstrations. The different manufacturing process of OLEDs has several advantages over flat panel displays made with LCD technology. OLEDs can be printed onto any suitable substrate by an inkjet printer or even by screen printing, theoretically making them cheaper to produce than LCD or plasma displays. However, fabrication of the OLED substrate is currently more costly than that of a TFT LCD. Roll-to-roll vapor-deposition methods for organic devices do allow mass production of thousands of devices per minute for minimal cost; however, this technique also induces problems: devices with multiple layers can be challenging to make because of registration - lining up the different printed layers to the required degree of accuracy. OLED displays can be fabricated on flexible plastic substrates, leading to the possible fabrication of flexible organic light-emitting diodes for other new applications, such as roll-up displays embedded in fabrics or clothing. If a substrate like polyethylene terephthalate (PET) can be used, the displays may be produced inexpensively. Furthermore, plastic substrates are shatter-resistant, unlike the glass displays used in LCD devices. OLEDs enable a greater contrast ratio and wider viewing angle compared to LCDs, because OLED pixels emit light directly. This also provides a deeper black level, since a black OLED display emits no light. Furthermore, OLED pixel colors appear correct and unshifted, even as the viewing angle approaches 90° from the normal. LCDs filter the light emitted from a backlight, allowing a small fraction of light through. Thus, they cannot show true black. However, an inactive OLED element does not produce light or consume power, allowing true blacks. Removing the backlight also makes OLEDs lighter because some substrates are not needed. When looking at top-emitting OLEDs, thickness also plays a role when talking about index match layers (IMLs). Emission intensity is enhanced when the IML thickness is 1.3–2.5 nm. The refractive value and the matching of the optical IMLs property, including the device structure parameters, also enhance the emission intensity at these thicknesses. OLEDs also have a much faster response time than an LCD. Using response time compensation technologies, the fastest modern LCDs can reach response times as low as 1 ms for their fastest color transition, and are capable of refresh frequencies as high as 240 Hz. According to LG, OLED response times are up to 1,000 times faster than LCD, putting conservative estimates at under 10 μs (0.01 ms), which could theoretically accommodate refresh frequencies approaching 100 kHz (100,000 Hz). Due to their extremely fast response time, OLED displays can also be easily designed to be strobed, creating an effect similar to CRT flicker in order to avoid the sample-and-hold behavior seen on both LCDs and some OLED displays, which creates the perception of motion blur. The biggest technical problem for OLEDs is the limited lifetime of the organic materials. One 2008 technical report on an OLED TV panel found that after 1,000 hours, the blue luminance degraded by 12%, the red by 7% and the green by 8%. In particular, blue OLEDs historically have had a lifetime of around 14,000 hours to half original brightness (five years at eight hours per day) when used for flat-panel displays. This is lower than the typical lifetime of LCD, LED or PDP technology; each currently is rated for about 25,000–40,000 hours to half brightness, depending on manufacturer and model. One major challenge for OLED displays is the formation of dark spots due to the ingress of oxygen and moisture, which degrades the organic material over time whether or not the display is powered. However, some manufacturers' displays aim to increase the lifespan of OLED displays, pushing their expected life past that of LCD displays by improving light outcoupling, thus achieving the same brightness at a lower drive current. In 2007, experimental OLEDs were created which can sustain 400 cd/m2 of luminance for over 198,000 hours for green OLEDs and 62,000 hours for blue OLEDs. In 2012 OLED lifetime to half of the initial brightness was improved to 900,000 hours for red, 1,450,000 hours for yellow and 400,000 hours for green at an initial luminance of 1,000 cd/m2. The OLED material used to produce blue light degrades much more rapidly than the materials used to produce other colors; in other words, blue light output will decrease relative to the other colors of light. This variation in the differential color output will change the color balance of the display, and is much more noticeable than a uniform decrease in overall luminance. This can be avoided partially by adjusting the color balance, but this may require advanced control circuits and input from a knowledgeable user. More commonly, though, manufacturers optimize the size of the R, G and B subpixels to reduce the current density through the subpixel in order to equalize lifetime at full luminance. For example, a blue subpixel may be 100% larger than the green subpixel. The red subpixel may be 10% smaller than the green. Improvements to the efficiency and lifetime of blue OLEDs is vital to the success of OLEDs as replacements for LCD technology. Considerable research has been invested in developing blue OLEDs with high external quantum efficiency, as well as a deeper blue color. External quantum efficiency values of 20% and 19% have been reported for red (625 nm) and green (530 nm) diodes, respectively. However, blue diodes (430 nm) have only been able to achieve maximum external quantum efficiencies in the range of 4% to 6%. Recent research focuses on organic materials exhibiting thermally activated delayed fluorescence (TADF), discovered at Kuyushu University OPERA and UC Santa Barbara CPOS. TADF would allow stable and high-efficiency solution processable[clarification needed] blue emitters, with internal quantum efficiencies reaching 100%. Blue TADF emitters are expected to market by 2020 and would be used for WOLED displays with phosphorescent color filters, as well as blue OLED displays with ink-printed QD color filters. Water can instantly damage the organic materials of the displays. Therefore, improved sealing processes are important for practical manufacturing. Water damage especially may limit the longevity of more flexible displays. As an emissive display technology, OLEDs rely completely upon converting electricity to light, unlike most LCDs which are to some extent reflective. E-paper leads the way in efficiency with ~ 33% ambient light reflectivity, enabling the display to be used without any internal light source. The metallic cathode in an OLED acts as a mirror, with reflectance approaching 80%, leading to poor readability in bright ambient light such as outdoors. However, with the proper application of a circular polarizer and antireflective coatings, the diffuse reflectance can be reduced to less than 0.1%. With 10,000 fc incident illumination (typical test condition for simulating outdoor illumination), that yields an approximate photopic contrast of 5:1. Advances in OLED technologies, however, enable OLEDs to become actually better than LCDs in bright sunlight. The AMOLED display in the Galaxy S5, for example, was found to outperform all LCD displays on the market in terms of brightness and reflectance. While an OLED will consume around 40% of the power of an LCD displaying an image that is primarily black, for the majority of images it will consume 60–80% of the power of an LCD. However, an OLED can use more than three times as much power to display an image with a white background, such as a document or web site. This can lead to reduced battery life in mobile devices when white backgrounds are used. 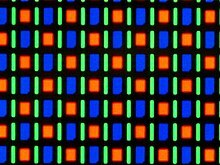 Magnified image of the AMOLED screen on the Google Nexus One smartphone using the RGBG system of the PenTile Matrix Family. Almost all OLED manufacturers rely on material deposition equipment that is largely made by a single company, Canon Tokki, a unit of Canon Inc. Canon Tokki is reported to have a near-monopoly of the giant OLED-manufacturing vacuum machines, notable for their 100-metre (330 ft) size. Other manufacurers are listed here  Apple has relied solely on Canon Tokki in its bid to introduce its own OLED displays for the iPhones released in 2017. OLED Displays are manufactured just like LCDs, see Liquid crystal display for details. OLED technology is used in commercial applications such as displays for mobile phones and portable digital media players, car radios and digital cameras among others, as well as lighting. Such portable display applications favor the high light output of OLEDs for readability in sunlight and their low power drain. Portable displays are also used intermittently, so the lower lifespan of organic displays is less of an issue. Prototypes have been made of flexible and rollable displays which use OLEDs' unique characteristics. Applications in flexible signs and lighting are also being developed. OLED lighting offers several advantages over LED lighting, such as higher quality illumination, more diffuse light source, and panel shapes. Philips Lighting have made OLED lighting samples under the brand name "Lumiblade" available online and Novaled AG based in Dresden, Germany, introduced a line of OLED desk lamps called "Victory" in September, 2011. Nokia introduced OLED mobile phones including the N85 and the N86 8MP, both of which feature an AMOLED display. OLEDs have also been used in most Motorola and Samsung color cell phones, as well as some HTC, LG and Sony Ericsson models. OLED technology can also be found in digital media players such as the Creative ZEN V, the iriver clix, the Zune HD and the Sony Walkman X Series. The Google and HTC Nexus One smartphone includes an AMOLED screen, as does HTC's own Desire and Legend phones. However, due to supply shortages of the Samsung-produced displays, certain HTC models will use Sony's SLCD displays in the future, while the Google and Samsung Nexus S smartphone will use "Super Clear LCD" instead in some countries. OLED displays were used in watches made by Fossil (JR-9465) and Diesel (DZ-7086). Other manufacturers of OLED panels include Anwell Technologies Limited (Hong Kong), AU Optronics (Taiwan), Chimei Innolux Corporation (Taiwan), LG (Korea), and others. In 2009, Shearwater Research introduced the Predator as the first color OLED diving computer available with a user replaceable battery. BlackBerry Limited, the maker of BlackBerry smartphones, uses OLED displays in their BlackBerry 10 devices. DuPont stated in a press release in May 2010 that they can produce a 50-inch OLED TV in two minutes with a new printing technology. If this can be scaled up in terms of manufacturing, then the total cost of OLED TVs would be greatly reduced. DuPont also states that OLED TVs made with this less expensive technology can last up to 15 years if left on for a normal eight-hour day. The use of OLEDs may be subject to patents held by Universal Display Corporation, Eastman Kodak, DuPont, General Electric, Royal Philips Electronics, numerous universities and others. There are by now thousands of patents associated with OLEDs, both from larger corporations and smaller technology companies. Flexible OLED displays are already being produced and these are used by manufacturers to create curved displays such as the Galaxy S7 Edge but so far there they are not in devices that can be flexed by the consumer. Apart from the screen itself the circuit boards and batteries would need to be flexible. Samsung demonstrated a roll-out display in 2016. Textiles incorporating OLEDs are an innovation in the fashion world and pose for a way to integrate lighting to bring inert objects to a whole new level of fashion. The hope is to combine the comfort and low cost properties of textile with the OLEDs properties of illumination and low energy consumption. Although this scenario of illuminated clothing is highly plausible, challenges are still a road block. Some issues include: the lifetime of the OLED, rigidness of flexible foil substrates, and the lack of research in making more fabric like photonic textiles. By 2004 Samsung, South Korea's largest conglomerate, was the world's largest OLED manufacturer, producing 40% of the OLED displays made in the world, and as of 2010 has a 98% share of the global AMOLED market. The company is leading the world of OLED industry, generating $100.2 million out of the total $475 million revenues in the global OLED market in 2006. As of 2006, it held more than 600 American patents and more than 2800 international patents, making it the largest owner of AMOLED technology patents. Samsung SDI announced in 2005 the world's largest OLED TV at the time, at 21 inches (53 cm). This OLED featured the highest resolution at the time, of 6.22 million pixels. In addition, the company adopted active matrix-based technology for its low power consumption and high-resolution qualities. This was exceeded in January 2008, when Samsung showcased the world's largest and thinnest OLED TV at the time, at 31 inches (78 cm) and 4.3 mm. In May 2008, Samsung unveiled an ultra-thin 12.1 inch (30 cm) laptop OLED display concept, with a 1,280×768 resolution with infinite contrast ratio. According to Woo Jong Lee, Vice President of the Mobile Display Marketing Team at Samsung SDI, the company expected OLED displays to be used in notebook PCs as soon as 2010. In October 2008, Samsung showcased the world's thinnest OLED display, also the first to be "flappable" and bendable. It measures just 0.05 mm (thinner than paper), yet a Samsung staff member said that it is "technically possible to make the panel thinner". To achieve this thickness, Samsung etched an OLED panel that uses a normal glass substrate. The drive circuit was formed by low-temperature polysilicon TFTs. Also, low-molecular organic EL materials were employed. The pixel count of the display is 480 × 272. The contrast ratio is 100,000:1, and the luminance is 200 cd/m2. The colour reproduction range is 100% of the NTSC standard. In the same month, Samsung unveiled what was then the world's largest OLED Television at 40-inch with a Full HD resolution of 1920 × 1080 pixels. In the FPD International, Samsung stated that its 40-inch OLED Panel is the largest size currently possible. The panel has a contrast ratio of 1,000,000:1, a colour gamut of 107% NTSC, and a luminance of 200 cd/m2 (peak luminance of 600 cd/m2). At the Consumer Electronics Show (CES) in January 2010, Samsung demonstrated a laptop computer with a large, transparent OLED display featuring up to 40% transparency and an animated OLED display in a photo ID card. Samsung's latest AMOLED smartphones use their Super AMOLED trademark, with the Samsung Wave S8500 and Samsung i9000 Galaxy S being launched in June 2010. In January 2011 Samsung announced their Super AMOLED Plus displays, which offer several advances over the older Super AMOLED displays: real stripe matrix (50% more sub pixels), thinner form factor, brighter image and an 18% reduction in energy consumption. At CES 2012, Samsung introduced the first 55" TV screen that uses Super OLED technology. On January 8, 2013, at CES Samsung unveiled a unique curved 4K Ultra S9 OLED television, which they state provides an "IMAX-like experience" for viewers. On August 13, 2013, Samsung announced availability of a 55-inch curved OLED TV (model KN55S9C) in the US at a price point of $8999.99. On September 6, 2013, Samsung launched its 55-inch curved OLED TV (model KE55S9C) in the United Kingdom with John Lewis. Samsung introduced the Galaxy Round smartphone in the Korean market in October 2013. The device features a 1080p screen, measuring 5.7 inches (14 cm), that curves on the vertical axis in a rounded case. The corporation has promoted the following advantages: A new feature called "Round Interaction" that allows users to look at information by tilting the handset on a flat surface with the screen off, and the feel of one continuous transition when the user switches between home screens. The Sony CLIÉ PEG-VZ90 was released in 2004, being the first PDA to feature an OLED screen. Other Sony products to feature OLED screens include the MZ-RH1 portable minidisc recorder, released in 2006 and the Walkman X Series. At the 2007 Las Vegas Consumer Electronics Show (CES), Sony showcased 11-inch (28 cm, resolution 960×540) and 27-inch (68.5 cm), full HD resolution at 1920 × 1080 OLED TV models. Both claimed 1,000,000:1 contrast ratios and total thicknesses (including bezels) of 5 mm. In April 2007, Sony announced it would manufacture 1000 11-inch (28 cm) OLED TVs per month for market testing purposes. On October 1, 2007, Sony announced that the 11-inch (28 cm) model, now called the XEL-1, would be released commercially; the XEL-1 was first released in Japan in December 2007. In May 2007, Sony publicly unveiled a video of a 2.5-inch flexible OLED screen which is only 0.3 millimeters thick. At the Display 2008 exhibition, Sony demonstrated a 0.2 mm thick 3.5 inch (9 cm) display with a resolution of 320×200 pixels and a 0.3 mm thick 11 inch (28 cm) display with 960×540 pixels resolution, one-tenth the thickness of the XEL-1. In July 2008, a Japanese government body said it would fund a joint project of leading firms, which is to develop a key technology to produce large, energy-saving organic displays. The project involves one laboratory and 10 companies including Sony Corp. NEDO said the project was aimed at developing a core technology to mass-produce 40 inch or larger OLED displays in the late 2010s. In October 2008, Sony published results of research it carried out with the Max Planck Institute over the possibility of mass-market bending displays, which could replace rigid LCDs and plasma screens. Eventually, bendable, see-through displays could be stacked to produce 3D images with much greater contrast ratios and viewing angles than existing products. Sony exhibited a 24.5" (62 cm) prototype OLED 3D television during the Consumer Electronics Show in January 2010. In January 2011, Sony announced the PlayStation Vita handheld game console (the successor to the PSP) will feature a 5-inch OLED screen. On February 17, 2011, Sony announced its 25" (63.5 cm) OLED Professional Reference Monitor aimed at the Cinema and high end Drama Post Production market. On June 25, 2012, Sony and Panasonic announced a joint venture for creating low cost mass production OLED televisions by 2013. As of 2010, LG Electronics produced one model of OLED television, the 15 inch 15EL9500 and had announced a 31" (78 cm) OLED 3D television for March 2011. On December 26, 2011, LG officially announced the "world's largest 55" OLED panel" and featured it at CES 2012. In late 2012, LG announces the launch of the 55EM9600 OLED television in Australia. In January 2015, LG Display signed a long term agreement with Universal Display Corporation for the supply of OLED materials and the right to use their patented OLED emitters. By 2017 brands using LG OLED panels include Panasonic, Sony, Toshiba, Philips and Loewe. Lumiotec is the first company in the world developing and selling, since January 2011, mass-produced OLED lighting panels with such brightness and long lifetime. Lumiotec is a joint venture of Mitsubishi Heavy Industries, ROHM, Toppan Printing, and Mitsui & Co. On June 1, 2011, Mitsubishi installed a 6-meter OLED 'sphere' in Tokyo's Science Museum. On January 6, 2011, Los Angeles-based technology company Recom Group introduced the first small screen consumer application of the OLED at the Consumer Electronics Show in Las Vegas. This was a 2.8" (7 cm) OLED display being used as a wearable video name tag. At the Consumer Electronics Show in 2012, Recom Group introduced the world's first video mic flag incorporating three 2.8" (7 cm) OLED displays on a standard broadcaster's mic flag. The video mic flag allowed video content and advertising to be shown on a broadcasters standard mic flag. The number of automakers using OLEDs is still rare and limited to the high-end of the market. For example, the 2010 Lexus RX features an OLED display instead of a thin film transistor (TFT-LCD) display. The Aston Martin DB9 incorporated the first automotive application of the OLED display, namely PMOLED, followed by the 2004 Jeep Grand Cherokee and the Chevrolet Corvette C6. Japanese manufacturer Pioneer Electronics produced the first car stereos with monochrome OLED displays. The 2015 Hyundai Sonata and Kia Soul EV use a 3.5" white PMOLED display. BMW announced the M4 GTS concept in 2015 which was their first car to use OLED tailights when it was released in 2016, with each taillights consisting of 15 individual OLED elements. And in 2017 BMW announced the M4 CS which used the same OLED tailights as the M4 GTS and which would be their second car to use them, they also announced M3 CS but it did not get OLED tailights but rather the normal LED tailights found in the 2016 LCI 3 series and 4 series models. On January 6, 2016, Dell announced the Ultrasharp UP3017Q OLED monitor at the Consumer Electronics Show in Las Vegas. The monitor was announced to feature a 30" 4K UHD OLED panel with a 120 Hz refresh rate, 0.1 millisecond response time, and a contrast ratio of 400,000:1. The monitor was set to sell at a price of $4,999 and release in March, 2016, just a few months later. As the end of March rolled around, the monitor was not released to the market and Dell did not speak on reasons for the delay. Reports suggested that Dell canceled the monitor as the company was unhappy with the image quality of the OLED panel, especially the amount of color drift that it displayed when you viewed the monitor from the sides. On April 13, 2017, Dell finally released the UP3017Q OLED monitor to the market at a price of $3,499 ($1,500 less than its original spoken price of $4,999 at CES 2016). In addition to the price drop, the monitor featured a 60 Hz refresh rate and a contrast ratio of 1,000,000:1. As of June, 2017, the monitor is no longer available to purchase from Dell's website. Apple began using OLED panels in its watches in 2015 and in its laptops in 2016 with the introduction of an OLED touchbar to the MacBook Pro. In 2017, Apple announced the introduction of their tenth anniversary iPhone X with their own optimized OLED display licensed from Universal Display Corporation. Apple has continued the use of the technology in the iPhone X's successors, the iPhone XS and iPhone XS Max. In 2014, Mitsubishi Chemical Corporation (MCC), a subsidiary of Mitsubishi Chemical Holdings, developed an OLED panel with a 30,000-hour life, twice that of conventional OLED panels. The search for efficient OLED materials has been extensively supported by simulation methods; it is possible to calculate important properties computationally, independent of experimental input, making materiels development cheaper. T. Tsujimura, OLED Display Fundamentals and Applications, Wiley-SID Series in Display Technology, New York (2017). ISBN 978-1-119-18731-8. Kordt, Pascal; et al. (2015). "Modeling of Organic Light Emitting Diodes: From Molecular to Device Properties". Advanced Functional Materials. 25 (13): 1955–1971. doi:10.1002/adfm.201403004. hdl:21.11116/0000-0001-6CD1-A. Shinar, Joseph (Ed. ), Organic Light-Emitting Devices: A Survey. NY: Springer-Verlag (2004). ISBN 0-387-95343-4. Hari Singh Nalwa (Ed. ), Handbook of Organic Electronics and Photonics, Volume 1–3. American Scientific Publishers, Los Angeles (2008). ISBN 1-58883-095-0. Kho, Mu-Jeong, Javed, T., Mark, R., Maier, E., and David, C. (2008) 'Final Report: OLED Solid State Lighting – Kodak European Research' MOTI (Management of Technology and Innovation) Project, Judge Business School of the University of Cambridge and Kodak European Research, Final Report presented on 4 March 2008 at Kodak European Research at Cambridge Science Park, Cambridge, UK., pages 1–12. ^ Kamtekar, K. T.; Monkman, A. P.; Bryce, M. R. (2010). "Recent Advances in White Organic Light-Emitting Materials and Devices (WOLEDs)". Advanced Materials. 22 (5): 572–582. doi:10.1002/adma.200902148. PMID 20217752. ^ D'Andrade, B. W.; Forrest, S. R. (2004). "White Organic Light-Emitting Devices for Solid-State Lighting". Advanced Materials. 16 (18): 1585–1595. doi:10.1002/adma.200400684. ^ Chang, Yi-Lu; Lu, Zheng-Hong (2013). "White Organic Light-Emitting Diodes for Solid-State Lighting". Journal of Display Technology. PP (99): 1. Bibcode:2013JDisT...9..459C. doi:10.1109/JDT.2013.2248698. ^ "PMOLED vs AMOLED – what's the difference? | OLED-Info". www.oled-info.com. Archived from the original on 2016-12-20. Retrieved 2016-12-16. ^ Bernanose, A.; Comte, M.; Vouaux, P. (1953). "A new method of light emission by certain organic compounds". J. Chim. Phys. 50: 64. doi:10.1051/jcp/1953500064. ^ Bernanose, A.; Vouaux, P. (1953). "Organic electroluminescence type of emission". J. Chim. Phys. 50: 261. doi:10.1051/jcp/1953500261. ^ Bernanose, A. (1955). "The mechanism of organic electroluminescence". J. Chim. Phys. 52: 396. doi:10.1051/jcp/1955520396. ^ Bernanose, A. & Vouaux, P. (1955). "Relation between organic electroluminescence and concentration of active product". J. Chim. Phys. 52: 509. ^ Kallmann, H.; Pope, M. (1960). "Positive Hole Injection into Organic Crystals". The Journal of Chemical Physics. 32 (1): 300. Bibcode:1960JChPh..32..300K. doi:10.1063/1.1700925. ^ Kallmann, H.; Pope, M. (1960). "Bulk Conductivity in Organic Crystals". Nature. 186 (4718): 31–33. Bibcode:1960Natur.186...31K. doi:10.1038/186031a0. ^ Mark, Peter; Helfrich, Wolfgang (1962). "Space-Charge-Limited Currents in Organic Crystals". Journal of Applied Physics. 33 (1): 205. Bibcode:1962JAP....33..205M. doi:10.1063/1.1728487. ^ Pope, M.; Kallmann, H. P.; Magnante, P. (1963). "Electroluminescence in Organic Crystals". The Journal of Chemical Physics. 38 (8): 2042. Bibcode:1963JChPh..38.2042P. doi:10.1063/1.1733929. ^ Sano, Mizuka; Pope, Martin; Kallmann, Hartmut (1965). "Electroluminescence and Band Gap in Anthracene". The Journal of Chemical Physics. 43 (8): 2920. Bibcode:1965JChPh..43.2920S. doi:10.1063/1.1697243. ^ Helfrich, W.; Schneider, W. (1965). "Recombination Radiation in Anthracene Crystals". Physical Review Letters. 14 (7): 229–231. Bibcode:1965PhRvL..14..229H. doi:10.1103/PhysRevLett.14.229. ^ Partridge, R (1983). "Electroluminescence from polyvinylcarbazole films: 1. Carbazole cations". Polymer. 24 (6): 733–738. doi:10.1016/0032-3861(83)90012-5. ^ Partridge, R (1983). "Electroluminescence from polyvinylcarbazole films: 2. Polyvinylcarbazole films containing antimony pentachloride". Polymer. 24 (6): 739–747. doi:10.1016/0032-3861(83)90013-7. ^ Partridge, R (1983). "Electroluminescence from polyvinylcarbazole films: 3. Electroluminescent devices". Polymer. 24 (6): 748–754. doi:10.1016/0032-3861(83)90014-9. ^ Partridge, R (1983). "Electroluminescence from polyvinylcarbazole films: 4. Electroluminescence using higher work function cathodes". Polymer. 24 (6): 755–762. doi:10.1016/0032-3861(83)90015-0. ^ a b c Tang, C. W.; Vanslyke, S. A. (1987). "Organic electroluminescent diodes". Applied Physics Letters. 51 (12): 913. Bibcode:1987ApPhL..51..913T. doi:10.1063/1.98799. ^ a b Burroughes, J. H.; Bradley, D. D. C.; Brown, A. R.; Marks, R. N.; MacKay, K.; Friend, R. H.; Burns, P. L.; Holmes, A. B. (1990). "Light-emitting diodes based on conjugated polymers". Nature. 347 (6293): 539–541. Bibcode:1990Natur.347..539B. doi:10.1038/347539a0. ^ Burroughes, J. H; Bradley, D. D. C; Brown, A. R; Marks, R. N; MacKay, K; Friend, R. H; Burns, P. L; Holmes, A. B (1990). "Light-emitting diodes based on conjugated polymers". Nature. 347 (6293): 539–541. Bibcode:1990Natur.347..539B. doi:10.1038/347539a0. ^ National Research Council (2015). The Flexible Electronics Opportunity. The National Academies Press. pp. 105–6. ISBN 978-0-309-30591-4. ^ Piromreun, Pongpun; Oh, Hwansool; Shen, Yulong; Malliaras, George G.; Scott, J. Campbell; Brock, Phil J. (2000). "Role of CsF on electron injection into a conjugated polymer". Applied Physics Letters. 77 (15): 2403. Bibcode:2000ApPhL..77.2403P. doi:10.1063/1.1317547. ^ D. Ammermann, A. Böhler, W. Kowalsky, Multilayer Organic Light Emitting Diodes for Flat Panel Displays Archived 2009-02-26 at the Wayback Machine, Institut für Hochfrequenztechnik, TU Braunschweig, 1995. ^ a b "Organic Light-Emitting Diodes Based on Graded Heterojunction Architecture Has Greater Quantum Efficiency". University of Minnesota. Archived from the original on 24 March 2012. Retrieved 31 May 2011. ^ Holmes, Russell; Erickson, N.; Lüssem, Björn; Leo, Karl (27 August 2010). "Highly efficient, single-layer organic light-emitting devices based on a graded-composition emissive layer". Applied Physics Letters. 97 (1): 083308. Bibcode:2010ApPhL..97a3308S. doi:10.1063/1.3460285. ^ Lin Ke, Peng; Ramadas, K.; Burden, A.; Soo-Jin, C. (June 2006). "INdium-Tin-Oxide-Free Organic Light-Emitting Devices". Transactions on Electron Devices. 53 (6): 1483–1486. Bibcode:2006ITED...53.1483K. doi:10.1109/ted.2006.874724. ^ Carter, S. A.; Angelopoulos, M.; Karg, S.; Brock, P. J.; Scott, J. C. (1997). "Polymeric anodes for improved polymer light-emitting diode performance". Applied Physics Letters. 70 (16): 2067. Bibcode:1997ApPhL..70.2067C. doi:10.1063/1.118953. ^ Friend, R. H.; Gymer, R. W.; Holmes, A. B.; Burroughes, J. H.; Marks, R. N.; Taliani, C.; Bradley, D. D. C.; Santos, D. A. Dos; Brdas, J. L.; Lgdlund, M.; Salaneck, W. R. (1999). "Electroluminescence in conjugated polymers". Nature. 397 (6715): 121–128. Bibcode:1999Natur.397..121F. doi:10.1038/16393. ^ "Spintronic OLEDs could be brighter and more efficient". Engineer (Online Edition): 1. 16 July 2012. ^ Davids, P. S.; Kogan, Sh. M.; Parker, I. D.; Smith, D. L. (1996). "Charge injection in organic light-emitting diodes: Tunneling into low mobility materials". Applied Physics Letters. 69 (15): 2270. Bibcode:1996ApPhL..69.2270D. doi:10.1063/1.117530. ^ Crone, B. K.; Campbell, I. H.; Davids, P. S.; Smith, D. L. (1998). "Charge injection and transport in single-layer organic light-emitting diodes". Applied Physics Letters. 73 (21): 3162. Bibcode:1998ApPhL..73.3162C. doi:10.1063/1.122706. ^ Crone, B. K.; Campbell, I. H.; Davids, P. S.; Smith, D. L.; Neef, C. J.; Ferraris, J. P. (1999). "Device physics of single layer organic light-emitting diodes". Journal of Applied Physics. 86 (10): 5767. Bibcode:1999JAP....86.5767C. doi:10.1063/1.371591. ^ Jin, Yi; Xu, Yanbin; Qiao, Zhi; Peng, Junbiao; Wang, Baozheng; Cao, Derong (2010). "Enhancement of Electroluminescence Properties of Red Diketopyrrolopyrrole-Doped Copolymers by Oxadiazole and Carbazole Units as Pendants". Polymer. 51 (24): 5726–5733. doi:10.1016/j.polymer.2010.09.046. ^ Bellmann, E.; Shaheen, S. E.; Thayumanavan, S.; Barlow, S.; Grubbs, R. H.; Marder, S. R.; Kippelen, B.; Peyghambarian, N. (1998). "New Triarylamine-Containing Polymers as Hole Transport Materials in Organic Light-Emitting Diodes: Effect of Polymer Structure and Cross-Linking on Device Characteristics". Chemistry of Materials. 10 (6): 1668–1676. doi:10.1021/cm980030p. ^ Sato, Y.; Ichinosawa, S.; Kanai, H. (1998). "Operation Characteristics and Degradation of Organic Electroluminescent Devices". IEEE Journal of Selected Topics in Quantum Electronics. 4 (1): 40–48. Bibcode:1998IJSTQ...4...40S. doi:10.1109/2944.669464. ^ Duarte, FJ; Liao, LS; Vaeth, KM (2005). "Coherence characteristics of electrically excited tandem organic light-emitting diodes". Optics Letters. 30 (22): 3072–4. Bibcode:2005OptL...30.3072D. doi:10.1364/OL.30.003072. PMID 16315725. ^ Duarte, FJ (2007). "Coherent electrically excited organic semiconductors: visibility of interferograms and emission linewidth". Optics Letters. 32 (4): 412–4. Bibcode:2007OptL...32..412D. doi:10.1364/OL.32.000412. PMID 17356670. ^ Bharathan, Jayesh; Yang, Yang (1998). "Polymer electroluminescent devices processed by inkjet printing: I. Polymer light-emitting logo". Applied Physics Letters. 72 (21): 2660. Bibcode:1998ApPhL..72.2660B. doi:10.1063/1.121090. ^ Kiebooms, R.; Menon, R.; Lee, K. (2001) in H. S. Nalwa, Handbook of Advanced Electronic and Photonic Materials and Devices Volume 8, Academic Press, 1–86. ^ Wagaman, Michael; Grubbs, Robert H. (1997). "Synthesis of PNV Homo- and Copolymers by a ROMP Precursor Route". Synthetic Metals. 84 (1–3): 327–328. doi:10.1016/S0379-6779(97)80767-9. ^ Wagaman, Michael; Grubbs, Robert H. (1997). "Synthesis of Organic and Water Soluble Poly(1,4-phenylenevinylenes) Containing Carboxyl Groups: Living Ring-Opening Metathesis Polymerization (ROMP) of 2,3-Dicarboxybarrelenes". Macromolecules. 30 (14): 3978–3985. Bibcode:1997MaMol..30.3978W. doi:10.1021/ma9701595. ^ Pu, Lin; Wagaman, Michael; Grubbs, Robert H. (1996). "Synthesis of Poly(1,4-naphthylenevinylenes): Metathesis Polymerization of Benzobarrelenes". Macromolecules. 29 (4): 1138–1143. Bibcode:1996MaMol..29.1138P. doi:10.1021/ma9500143. ^ Fallahi, Afsoon; Alahbakhshi, Masoud; Mohajerani, Ezeddin; Afshar Taromi, Faramarz; Mohebbi, Alireza; Shahinpoor, Mohsen (2015). "Cationic Water-Soluble Conjugated Polyelectrolytes/Graphene Oxide Nanocomposites as Efficient Green Hole Injection Layers in Organic Light Emitting Diodes". The Journal of Physical Chemistry C. 119 (23): 13144–13152. doi:10.1021/acs.jpcc.5b00863. ^ a b Yang, Xiaohui; Neher, Dieter; Hertel, Dirk; Daubler, Thomas (2004). "Highly Efficient Single-Layer Polymer Electrophosphorescent Devices". Advanced Materials. 16 (2): 161–166. doi:10.1002/adma.200305621. ^ a b Baldo, M. A.; O'Brien, D. F.; You, Y.; Shoustikov, A.; Sibley, S.; Thompson, M. E.; Forrest, S.R. (1998). "Highly Efficient phosphorescent emission from organic electroluminescent devices". Nature. 395 (6698): 151–154. Bibcode:1998Natur.395..151B. doi:10.1038/25954. ^ a b Baldo, M. A.; Lamansky, S.; Burrows, P. E.; Thompson, M. E.; Forrest, S. R. (1999). "Very high-efficiency green organic light-emitting devices based on electrophosphorescence". Applied Physics Letters. 75 (1): 4. Bibcode:1999ApPhL..75....4B. doi:10.1063/1.124258. ^ Adachi, C.; Baldo, M. A.; Thompson, M. E.; Forrest, S. R. (2001). "Nearly 100% internal phosphorescence efficiency in an organic light-emitting device". Journal of Applied Physics. 90 (10): 5048. Bibcode:2001JAP....90.5048A. doi:10.1063/1.1409582. ^ Singh, Madhusudan; Chae, Hyun Sik; Froehlich, Jesse D.; Kondou, Takashi; Li, Sheng; Mochizuki, Amane; Jabbour, Ghassan E. (2009). "Electroluminescence from printed stellate polyhedral oligomeric silsesquioxanes". Soft Matter. 5 (16): 3002. Bibcode:2009SMat....5.3002S. doi:10.1039/b903531a. ^ Bardsley, J. N. (2004). "International OLED Technology Roadmap". IEEE Journal of Selected Topics in Quantum Electronics. 10 (1): 3–4. Bibcode:2004IJSTQ..10....3B. doi:10.1109/JSTQE.2004.824077. ^ "LG OLED TV Display Technology Shoot-Out". Archived from the original on 2017-01-16. Retrieved 2017-03-01. ^ Chu, Ta-Ya; Chen, Jenn-Fang; Chen, Szu-Yi; Chen, Chao-Jung; Chen, Chin H. (2006). "Highly efficient and stable inverted bottom-emission organic light emitting devices". Applied Physics Letters. 89 (5): 053503. Bibcode:2006ApPhL..89e3503C. doi:10.1063/1.2268923. ^ Takatoshi, Tsujimura (April 3, 2017). OLED Display Fundamentals and Applications (2 ed.). New York: John Wiley & Sons, Inc. ISBN 978-1-119-18731-8. ^ Liu, Jie; Lewis, Larry N.; Duggal, Anil R. (2007). "Photoactivated and patternable charge transport materials and their use in organic light-emitting devices". Applied Physics Letters. 90 (23): 233503. Bibcode:2007ApPhL..90w3503L. doi:10.1063/1.2746404. ^ Boroson, Michael; Tutt, Lee; Nguyen, Kelvin; Preuss, Don; Culver, Myron; Phelan, Giana (2005). "16.5L: Late-News-Paper: Non-Contact OLED Color Patterning by Radiation-Induced Sublimation Transfer (RIST)". SID Symposium Digest of Technical Papers. 36: 972. doi:10.1889/1.2036612. ^ Grimaldi, I. A.; De Girolamo Del Mauro, A.; Nenna, G.; Loffredo, F.; Minarini, C.; Villani, F.; d’Amore, A.; Acierno, D.; Grassia, L. (2010). "Inkjet Etching of Polymer Surfaces to Manufacture Microstructures for OLED Applications". V INTERNATIONAL CONFERENCE ON TIMES OF POLYMERS (TOP) AND COMPOSITES. AIP Conference Proceedings. AIP Conference Proceedings. 1255: 104–106. Bibcode:2010AIPC.1255..104G. doi:10.1063/1.3455544. ^ Bower, C. A.; Menard, E.; Bonafede, S.; Hamer, J. W.; Cok, R. S. (2011). "Transfer-Printed Microscale Integrated Circuits for High Performance Display Backplanes". IEEE Transactions on Components, Packaging and Manufacturing Technology. 1 (12): 1916–1922. doi:10.1109/TCPMT.2011.2128324. ^ Sasaoka, Tatsuya; Sekiya, Mitsunobu; Yumoto, Akira; Yamada, Jiro; Hirano, Takashi; Iwase, Yuichi; Yamada, Takao; Ishibashi, Tadashi; Mori, Takao; Asano, Mitsuru; Tamura, Shinichiro; Urabe, Tetsuo (2001). "24.4L: Late-News Paper: A 13.0-inch AM-OLED Display with Top Emitting Structure and Adaptive Current Mode Programmed Pixel Circuit (TAC)". SID Symposium Digest of Technical Papers. 32: 384. doi:10.1889/1.1831876. ^ Tsujimura, T.; Kobayashi, Y.; Murayama, K.; Tanaka, A.; Morooka, M.; Fukumoto, E.; Fujimoto, H.; Sekine, J.; Kanoh, K.; Takeda, K.; Miwa, K.; Asano, M.; Ikeda, N.; Kohara, S.; Ono, S.; Chung, C. T.; Chen, R. M.; Chung, J. W.; Huang, C. W.; Guo, H. R.; Yang, C. C.; Hsu, C. C.; Huang, H. J.; Riess, W.; Riel, H.; Karg, S.; Beierlein, T.; Gundlach, D.; Alvarado, S.; et al. (2003). "4.1: A 20-inch OLED Display Driven by Super-Amorphous-Silicon Technology". SID Symposium Digest of Technical Papers. 34: 6. doi:10.1889/1.1832193. ^ Pardo, Dino A.; Jabbour, G. E.; Peyghambarian, N. (2000). "Application of Screen Printing in the Fabrication of Organic Light-Emitting Devices". Advanced Materials. 12 (17): 1249–1252. doi:10.1002/1521-4095(200009)12:17<1249::AID-ADMA1249>3.0.CO;2-Y. ^ "Comparison of OLED and LCD". Fraunhofer IAP: OLED Research. 2008-11-18. Archived from the original on February 4, 2010. Retrieved 2010-01-25. ^ Zhang, Mingxiao; Chen, Z.; Xiao, L.; Qu, B.; Gong, Q. (18 March 2013). "Optical design for improving optical properties of top-emitting organic light emitting diodes". Journal of Applied Physics. 113 (11): 113105–113105–5. Bibcode:2013JAP...113k3105Z. doi:10.1063/1.4795584. ^ "LG 55EM9700". 2013-01-02. Archived from the original on 2015-01-15. Retrieved 2015-01-14. ^ "Why Do Some OLEDs Have Motion Blur?". Blur Busters Blog (based on Microsoft Research work). 2013-04-15. Archived from the original on 2013-04-03. Retrieved 2013-04-18. ^ "OLED TV estimated lifespan shorter then expected". HDTV Info Europe. Hdtvinfo.eu (2008-05-08). ^ HP Monitor manual. CCFL-Backlit LCD. Page 32. Webcitation.org. Retrieved 2011-10-04. ^ Viewsonic Monitor manual. LED-Backlit LCD. Webcitation.org. Retrieved 2011-10-04. ^ Phatak, Radhika. "Dependence of dark spot growth on cathode/organic interfacial adhesion in Organic Light Emitting Devices" (PDF). UWSpace. University of Waterloo. p. 21. Retrieved 22 April 2019. ^ Kondakov, D; Lenhart, W.; Nochols, W. (2007). "Operational degradation of organic light-emitting diodes: Mechanism and identification of chemical products". Journal of Applied Physics. 101 (2): 024512–024512–7. Bibcode:2007JAP...101b4512K. doi:10.1063/1.2430922. ^ "OLED lifespan doubled?" HDTV Info Europe. Hdtvinfo.eu (2008-01-25). ^ "OLED Lifetime: introduction and market status | OLED-Info". www.oled-info.com. Retrieved 2019-04-18. ^ "Ageless OLED". Archived from the original on 2007-09-08. Retrieved 2009-11-16. ^ Fallahi, Afsoon; Afshar Taromi, Faramarz; Mohebbi, Alireza; D. Yuen, Jonathan; Shahinpoor, Mohsen (2014). "A novel ambipolar polymer: from organic thin-film transistors to enhanced air-stable blue light emitting diodes". Journal of Materials Chemistry C. 2 (32): 6491. doi:10.1039/c4tc00684d. ^ Shen, Jiun Yi; Lee, Chung Ying; Huang, Tai-Hsiang; Lin, Jiann T.; Tao, Yu-Tai; Chien, Chin-Hsiung; Tsai, Chiitang (2005). "High Tg blue emitting materials for electroluminescent devices". Journal of Materials Chemistry (free text)|format= requires |url= (help). 15 (25): 2455. doi:10.1039/b501819f. ^ Kim, Seul Ong; Lee, Kum Hee; Kim, Gu Young; Seo, Ji Hoon; Kim, Young Kwan; Yoon, Seung Soo (2010). "A highly efficient deep blue fluorescent OLED based on diphenylaminofluorenylstyrene-containing emitting materials". Synthetic Metals. 160 (11–12): 1259–1265. doi:10.1016/j.synthmet.2010.03.020. ^ Jabbour, G. E.; Kawabe, Y.; Shaheen, S. E.; Wang, J. F.; Morrell, M. M.; Kippelen, B.; Peyghambarian, N. (1997). "Highly efficient and bright organic electroluminescent devices with an aluminum cathode". Applied Physics Letters. 71 (13): 1762. Bibcode:1997ApPhL..71.1762J. doi:10.1063/1.119392. ^ Mikami, Akiyoshi; Koshiyama, Tatsuya; Tsubokawa, Tetsuro (2005). "High-Efficiency Color and White Organic Light-Emitting Devices Prepared on Flexible Plastic Substrates". Japanese Journal of Applied Physics. 44 (1B): 608–612. Bibcode:2005JaJAP..44..608M. doi:10.1143/JJAP.44.608. ^ Mikami, Akiyoshi; Nishita, Yusuke; Iida, Yoichi (2006). "35-3: High Efficiency Phosphorescent Organic Light-Emitting Devices Coupled with Lateral Color-Conversion Layer". SID Symposium Digest of Technical Papers. 37: 1376. doi:10.1889/1.2433239. ^ "Kyulux signs JDA agreements with both SDC and LGD - aims to have commercial ready TADF/HF emitters ready by mid 2019 | OLED-Info". ^ "Cynora to present its latest blue TADF emitter at the OLEDs World Summit conference | OLED-Info". ^ "OLED Sealing Process Reduces Water Intrusion and Increases Lifetime". Georgia Tech Research News. 2008-04-23. Archived from the original on 2008-07-08. ^ Stokes, Jon. (2009-08-11) This September, OLED no longer "three to five years away" Archived 2012-01-25 at the Wayback Machine. Arstechnica.com. Retrieved 2011-10-04. ^ Alpeyev, Pavel; Taniguchi, Takako (2017-04-24). "Ahead of next iPhone, Idemitsu Kosan leads way after developing OLED screen". The Japan Times Online. ISSN 0447-5763. Retrieved 2018-05-31. ^ Alpeyev, Pavel; Amano, Takashi (2016-12-21). "Apple's Search for Better iPhone Screens Leads to Japan's Rice Fields". Bloomberg.com. Retrieved 2018-05-31. ^ a b Nguyen, Tuan C. (2015-01-05). "What you need to know about OLED lighting". Washington Post. ISSN 0190-8286. Retrieved 2017-09-22. ^ Michael Kanellos, "Start-up creates flexible sheets of light", CNet News.com, December 6, 2007. Retrieved 20 July 2008. ^ "Philips Lumiblades". Lumiblade.com. 2009-08-09. Retrieved 2009-08-17. ^ Session Border Controller Archived 2012-07-10 at the Wayback Machine. Tmcnet.com (2011-09-13). Retrieved 2012-11-12. ^ Electronic News, OLEDs Replacing LCDs in Mobile Phones Archived 2016-10-11 at the Wayback Machine, April 7, 2005. Retrieved September 5, 2016. ^ "HTC ditches Samsung AMOLED display for Sony's Super LCDs". International Business Times. 2010-07-26. Archived from the original on October 1, 2011. Retrieved 2010-07-30. ^ "Google Nexus S to feature Super Clear LCD in Russia (and likely in other countries, too)". UnwiredView.com. 2010-12-07. Archived from the original on 2010-12-10. Retrieved 2010-12-08. ^ "ANWELL: Higher profit, higher margins going forward". nextinsight.com. 2007-08-15. Archived from the original on 2012-03-21. ^ "AUO". OLED-Info.com. 2012-02-21. Archived from the original on 2012-01-24. ^ "Chi Mei EL (CMEL)". OLED-Info.com. Archived from the original on 2016-01-05. ^ "LG OLEDs". OLED-Info.com. Archived from the original on 2016-01-31. ^ "OLED companies". OLED-info.com. Archived from the original on 2016-02-21. ^ Rawlings, John (2010-08-07). "OLED Shearwater Predator Dive Computer Review". AtlasOmega Media. Archived from the original on 2014-05-27. Retrieved 2013-04-10. ^ Tourish, Jeff. "Shearwater Predator CCR Computer". Advanced Diver Magazine. Archived from the original on 2015-10-17. Retrieved 2013-04-10. ^ "DuPont Creates 50" OLED in Under 2 Minutes". tomsguide.com. Archived from the original on 2010-05-20. Retrieved 2010-06-10. ^ "DuPont Delivers OLED Technology Scalable for Television". www2.dupont.com. 2010-05-12. Archived from the original on 2010-05-20. Retrieved 2010-05-12. ^ OLED-Info.com, Kodak Signs OLED Cross-License Agreement Archived 2007-07-07 at the Wayback Machine. Retrieved March 14, 2008. ^ "Flexible OLED | OLED-Info". www.oled-info.com. Archived from the original on 2017-03-11. Retrieved 2017-03-25. ^ "Samsung Galaxy X: the story of Samsung's foldable phone so far". TechRadar. Archived from the original on 2017-01-30. Retrieved 2017-03-25. ^ "Samsung SDI – The world's largest OLED display maker". Oled-info.com. Archived from the original on 2009-06-22. Retrieved 2009-08-17. ^ "Samsung, LG in legal fight over brain drain". The Korea Times. 2010-07-17. Archived from the original on 2010-07-21. Retrieved 2010-07-30. ^ a b "Frost & Sullivan Recognizes Samsung SDI for Market Leadership in the OLED Display Market | Find Articles at BNET". Findarticles.com. 2008-07-17. Archived from the original on 2009-05-22. Retrieved 2009-08-17. ^ "World's Largest 21-inch OLED for TVs from Samsung". Physorg.com. 2005-01-04. Archived from the original on 2009-01-12. Retrieved 2009-08-17. ^ Robischon, Noah (2008-01-09). "Samsung's 31-Inch OLED Is Biggest, Thinnest Yet – AM-OLED". Gizmodo. Archived from the original on 2009-08-10. Retrieved 2009-08-17. ^ Ricker, Thomas (2008-05-16). "Samsung's 12.1-inch OLED laptop concept makes us swoon". Engadget. Archived from the original on 2009-10-07. Retrieved 2009-08-17. ^ "Samsung: OLED Notebooks In 2010". Laptop News. TrustedReviews. Archived from the original on 2009-04-16. Retrieved 2009-08-17. ^ a b Takuya Otani; Nikkei Electronics (2008-10-29). "[FPDI] Samsung Unveils 0.05mm 'Flapping' OLED Panel – Tech-On!". Techon.nikkeibp.co.jp. Archived from the original on 2008-11-27. Retrieved 2009-08-17. ^ "Samsung presents world's first and largest transparent OLED laptop at CES". 2010-01-07. Archived from the original on January 11, 2010. ^ "CES: Samsung shows OLED display in a photo card". 2010-01-07. Archived from the original on 2011-12-20. ^ "Samsung Super AMOLED Plus display announced". Archived from the original on 2011-01-09. Retrieved 2011-01-06. ^ Clark, Shaylin (2012-01-12). "CES 2012 Samsung's OLED TV Rakes In Awards". WebProNews. Archived from the original on 2012-11-24. Retrieved 2012-12-03. ^ Rougeau, Michael (2013-01-08). Samsung's curved OLED TV provides an 'IMAX-like' experience Archived 2013-01-11 at the Wayback Machine. Techradar. Retrieved 2013-01-08. ^ Boylan, Chris (2013-08-13). "Bring Out Your OLED: Samsung KN55S9C OLED TV Available Now for $8999.99" Archived 2013-08-17 at the Wayback Machine. Big Picture Big Sound. Retrieved 2013-08-13. ^ Alex Lane (6 September 2013). "John Lewis TV Gallery video: 4K and OLED from Samsung, Sony, LG and Panasonic". Recombu. Archived from the original on 27 September 2013. Retrieved 26 September 2013. ^ Sam Byford (8 October 2013). "Samsung's Galaxy Round is the first phone with a curved display". The Verge. Vox Media, Inc. Archived from the original on 9 November 2013. Retrieved 10 November 2013. 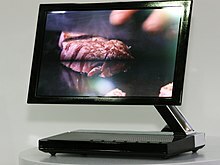 ^ a b Sony XEL-1:The world's first OLED TV Archived 2016-02-05 at the Wayback Machine, OLED-Info.com (2008-11-17). ^ "Sony's Clie PEG-VZ90—the world's most expensive Palm?". Engadget. 2004-09-14. Archived from the original on 2010-02-09. Retrieved 2010-07-30. ^ "MD Community Page: Sony MZ-RH1". Minidisc.org. 2007-02-24. Archived from the original on 2009-05-20. Retrieved 2009-08-17. ^ "Sony NWZ-X1000-series OLED Walkman specs released". Slashgear. 2009-03-09. Archived from the original on 2011-02-04. Retrieved 2011-01-01. ^ The Sony Drive XEL-1 OLED TV: 1,000,000:1 contrast starting December 1st Archived 2007-10-04 at the Wayback Machine, Engadget (2007-10-01). ^ "Sony claims development of world's first flexible, full-color OLED display". Gizmo Watch. 2007-05-25. Archived from the original on 2007-10-17. Retrieved 2010-07-30. ^ Sony's 3.5- and 11-inch OLEDs are just 0.008- and 0.012-inches thin Archived 2016-01-05 at the Wayback Machine. Engadget (2008-04-16). Retrieved 2011-10-04. ^ Athowon, Desire (2008). "Sony Working on Bendable, Folding OLED Screens". ITProPortal.com. Archived from the original on October 9, 2008. ^ "Sony OLED 3D TV eyes-on". Engadget. Archived from the original on 2010-01-10. Retrieved 2010-01-11. ^ Snider, Mike (2011-01-28). "Sony unveils NGP, its new portable gaming device". USA Today. Retrieved 2011-01-27. ^ "Sony Professional Reference Monitor". Sony. Archived from the original on 2012-03-08. Retrieved 2011-02-17. ^ "Sony, Panasonic tying up in advanced TV displays". June 25, 2012. ^ LG 15EL9500 OLED Television Archived 2012-04-14 at the Wayback Machine. Lg.com. Retrieved 2011-10-04. ^ LG announces 31" OLED 3DTV Archived 2016-03-04 at the Wayback Machine. Electricpig.co.uk (2010-09-03). Retrieved 2011-10-04. ^ LG's 55-inch 'world's largest' OLED HDTV panel is official, coming to CES 2012 Archived 2011-12-26 at the Wayback Machine. Engadget (2011-12-25). Retrieved 2012-11-12. ^ MITSUBISHI ELECTRIC News Releases Installs 6-Meter OLED Globe at Science Museum Archived 2012-07-23 at the Wayback Machine. Mitsubishielectric.com (2011-06-01). Retrieved 2012-11-12. ^ Coxworth, Ben (2011-03-31). Video Name Tags turn salespeople into walking TV commercials Archived 2011-12-22 at the Wayback Machine. Gizmag.com. Retrieved 2012-11-12. ^ Three Minutes of Video Every Broadcaster and Advertiser MUST SEE.avi – CBS Videos : Firstpost Topic – Page 1 Archived 2012-07-23 at the Wayback Machine. Firstpost.com (2012-08-10). Retrieved 2012-11-12. ^ "Dell unveils stunning 4K OLED UltraSharp display and declares war on bezels". PCWorld. Retrieved 2017-06-20. ^ "OLED monitor: market status and updates | OLED-Info". www.oled-info.com. Retrieved 2017-06-20. ^ "Apple unveils a thinner MacBook Pro with an OLED 'Touch Bar'". Engadget. Retrieved 2017-09-22. ^ "OLED vs LCD: How the iPhone X's display changes everything". Macworld. Retrieved 2017-09-22. ^ From Molecules to Organic Light Emitting Diodes Archived 2015-04-15 at the Wayback Machine, Max Planck Institute for Polymer Research, 7 April 2015. ^ Kordt, Pascal; et al. (2015). "Modeling of Organic Light Emitting Diodes: From Molecular to Device Properties". Advanced Functional Materials. 25 (13): 1955–1971. doi:10.1002/adfm.201403004. hdl:21.11116/0000-0001-6CD1-A. ^ Display, New Vision (12 February 2018). "Between cut-throat competition, Which is better OLED, LCD or PMOLED". Wikimedia Commons has media related to OLED. This page was last edited on 22 April 2019, at 18:24 (UTC).